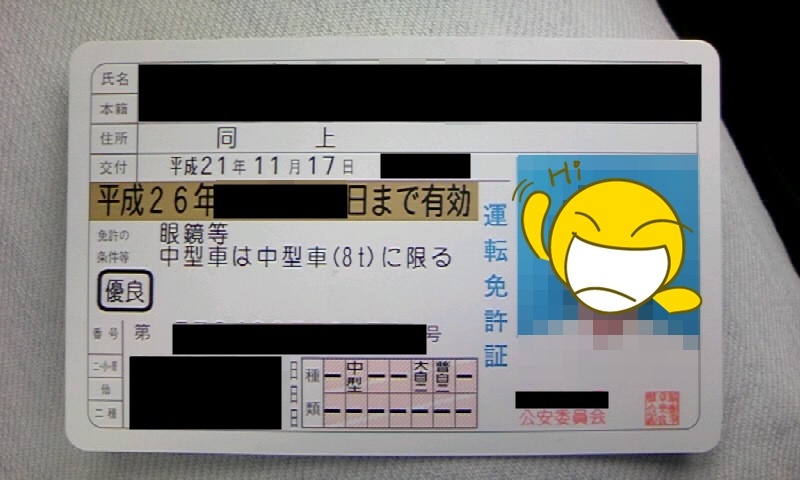 Japanese driver's licenses work on a point system: Do something wrong, get some points. Get enough points, and your license is suspended. The handy Compendium of Driver's License Questions website has put together the following chart, slightly tweaked into English by us. When your license is suspended, you retain possession of it, but you are not allowed to drive on it for the specified period of time (indicated in number of days at the top of the chart: 30日, 60日, etc.) Driving during this period is classified as driving without a license, which offence carries enough points to ensure that your driving privileges will be revoked. Traffic safety courses (免許停止処分者講習, menkyo teishi shobunsha koushuu) are available to take to reduce the number of days on a suspension, but the courses are usually only available during business hours on weekdays. When your license is revoked, it is taken from you entirely. The time periods indicated in the chart above (1年, 2年, etc.) are called 欠格期間, kekkaku kikan, are represent the amount of time before you will be allowed to apply for a new license. In other words, if your license is revoked, it will not be returned to you, ever. You will have to start from scratch at a driving school--or more likely the test center at a licensing center, as many driving schools will refuse to enroll individuals who have lost their licenses--and obtain a new driver's license if you wish to continue driving. By the way, in Japan, driving while intoxicated is an offence that carries enough points for immediate revocation. As you can see in the chart, fewer points result in harsher penalties if you have accumulated a number of past offences. Your number of past offences is based on the number of times your license has been suspended. This number continues to accumulate until you pass one consecutive calendar year without being cited for any traffic violations, after which it is reset to zero. Handled similarly to past offences, the standing number of points on your license continues to accumulate until it is either suspended (points return to 0 at the end of the suspension period), revoked (you lose your license), or you pass one full calendar year without any traffic violations (points return to 0). Events such as your license expiring and being reissued or your birthday passing are irrelevant to this timeframe. The only concern is the date of your last citation--or, more correctly, the date at which you received official notification (usually by postcard) of your violation and paid the applicable fines or other punishment. On the other hand, if you go for two full years without any violations, there's a perk: Points for subsequent violations will not accumulate for a full year but only for the next three months, after which your total number of points will return to zero. If you have two violations within three months, or if your license is suspended, however, you lose this status. Furthermore, if you pass five consecutive years without any traffic violations and without any accidents*, your license will be reissued in a fancy gold color to indicate that you are an outstanding(ly safe) driver. This will in turn ease your license renewal process and reduce your insurance premiums. *Reported accidents, that is. That late-night scuff against a telephone pole or nudge against a parked car in a dark alley don't have to count. Lesson in point? Avoid citations. They'll get you mired up quick. I just got my JDL (yep went thru a driving school) and might have got caught speeding. I say this 'cause I saw a red flashbulb-type light go off recently as I was tooling down the highway. The rest is a little hazy for me cause I started to freak out, but I think I may have been doing 136 in an 80 zone. Am I going to lose my license fully (revoked) and have to start over from scratch or is there a chance I may get to keep it (suspended)? ...a 50 kph or greater excess of speed is a 12 point infraction. On a clean record, that means a 90 day suspension, not a revocation. From what I understand, the flashbulb goes off, taking a picture of your car and license plate. Then a ticket is mailed to the address associated with the car. So whatever address is on the shakensho of the car you were driving will receive the ticket. I believe it is just assumed that the owner was driving the car. I don't know what happens if someone other than the owner is driving, and actually, that'd be a good topic to research for another article. By the way, I have heard more than a few stories of people who swear they got flashbulbed but a ticket never came. I suppose it is possible that the camera sometimes doesn't get a clean shot of the license plate. Keep your fingers crossed, and we'd love an update of how things turn out for you. Thank you soooo much for your speedy reply! Funny you should mention it, but... it was my father-in-law's car. That means the tix (if one is issued -- FINGERS X'd) is going straight to him. I am beside myself with fear. Oh, I probably should have mentioned this too, but I am a still a "new" driver. Meaning that my JDL is only a few months old. Do you know how my newbie-ness will change things? Like am I gonna have to sit thru another test? In addition to the 70+ I get in fines and possible year-long loss? If you take the course and afterward accumulate 3 more points, it looks like your license is suspended for 30 days and you are automatically required to retake the driving exam at your next renewal. The page goes on to state that if your license is revoked while you are on a green license, you won't have any waiting period before you are allowed to take the driving test again. (So a revocation on the green license carries less punishment than a revocation on a blue/gold license, it would seem.) Bear in mind that my source is just a Yahoo! Answers page; but the several answers on the page at least aren't in conflict with each other. Dang. Sorry to hear it. Was the speed they cited you for at least less than what you thought you were doing? I lost 38 points for causing a car accident. So lose my license for 3 years. Do you know if I'm elligable to take the lecture and get it back? No. Everything I have read leads me to believe that you will have to take the driving test again from scratch, and that you will probably have to take the test at your regional driving center (not at a driving school). You'll have to wait until the revocation period has ended before you can apply to take the test again. Question about Parking tickets. My family car is registered to me and if I or my wife gets a parking ticket does that mean that by default I receive points? How do points for parking tickets work? And is it possible that you can check on how many points you currently have? Yes, I believe points for parking violations count against the license of the registered owner of the car. One of our other writers here got a ticket for parking longer than 60 minutes in a 60-minutes-only zone or something like that. There was a notification stuck to his car and he later got something in the mail. His particular offence cost him two points, from what I remember. In the context of camera traps, I have heard stories of people denying that they were the driver of the car (truthfully or otherwise) in order to avoid the penalty. Theoretically you could go to the police with the parking ticket and insist that you were not the driver of the car that day and that the points should not be applied to your license. However, as the registered owner of the car you are responsible for its use--to know where it is and who is using it at all times. In other words, if you were speeding or illegally parked and insist that someone else was driving, yet refuse to say or do not know who the actual driver was, I believe the police can still hold you accountable due to your responsibilities as owner of the vehicle. Yes, it is possible to check your current number of points. They are listed on an official document called a 累積点数証明書交付申請書. Getting a copy of this document is a bureaucratic procedure: Fill out an application at your local police station, pay a small fee (something like 700 yen), and wait several days for the document to be mailed to your home address. The document with the points is called a 累積点数証明書. The application form to get such a document is called a 累積点数証明書交付申請書. How do you check, how many points we have left in our licence ? The only way I know to check your driving record is to visit your local police station or licensing center in person. You fill out a form, called a 累積点数証明書交付申請書, and submit it along with photo ID and a small fee. It is not possible to check the number of points on your license by telephone or Internet. However, every time you have been issued a citation by an officer or mailed one after being caught by a highway camera, the number of points added to your license should be clearly explained. If you add these numbers together, you'll know your number of standing points. Very informative thank you! Gotten a 3 tickets in 3 months and have just been waiting for the letter to turn in my license but this explains it! Arigatou! What happens if i get stopped by the police and they only gave a warning but took down details of my JDL and alien card info? Would it go on their system anywhere or would that mean that points would be deducted? i just got the 6 points limit of my driving license and then they send me a hagaki to attend a 3hr seminar after i attend the seminar can i drive again? how about the points? do they reset it to zero? Hello, i want to ask about overspeed violation. If several cameras caught us overspeeding in expway, did each camera will record and give one ticket for each camera? Or it will be an accumulative record?